Silicon Valley’s time is limited. The country’s tech hub faces increasing competition with software hiring rates increasing by 14.1 percent across the U.S. in the past year, and tech entering the top 10 lists of economic contributors for 42 states. By 2026, the U.S. Bureau of Labor Statistics estimates the total potential tech workforce reaching 1.2 million employees. That’s a lot of jobs to fill. Is one of them right for you? Good news: you can overcome it. We believe tech education should be accessible to everyone. If you could try your strengths and learn at your own pace, you might just become a coding enthusiast - and even go on to have a rewarding career with a title like Software Engineer. That’s why we created Kenzie Free. Kenzie Free is a series of free, online mini-courses which help you overcome tech intimidation and try coding. Our Intro to Web Development program covers the basics of HTML and CSS. HTML (Hypertext Markup Language) is used to create web pages and their written text, and CSS (Cascade Styling Sheets) is used for the website’s design elements like layout and background color. 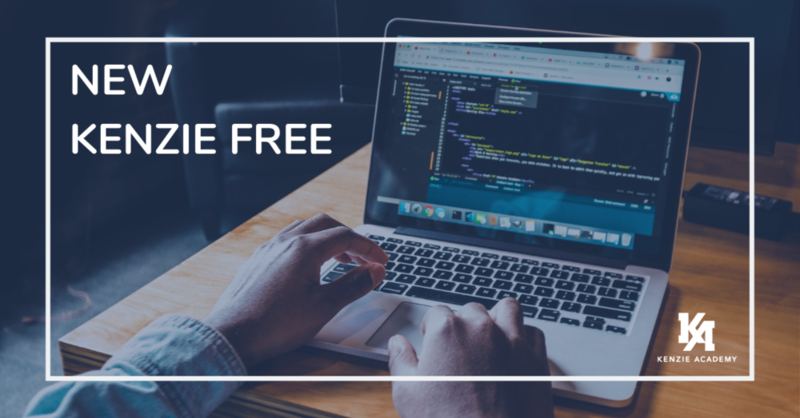 The Kenzie Free curriculum was developed by industry experts (from Google, LinkedIn, and Zillow) and is accessible to beginners and those with some prior experience. Brief tutorial videos will guide you as you write practice lines of code and see the results in real-time. There’s no need to rush or worry about test results. This is a place to make mistakes and be imperfect. Most importantly, it’s a place to learn. Kenzie Free puts your enjoyment and understanding first. We’ll introduce relevant industry tools while also explaining why and how these technologies work the way they do. You’ll become acquainted with a new industry and learn some marketable skills - all in one sitting. Overcome your tech intimidation and start Kenzie Free. David Good wants to make education accessible and affordable for everyone. Through stints at UniversityNow and IDEO he has learned what works and doesn't work in tech-enabled education, and he is focused on doing more of what works. He has an MBA from Cal Berkeley (Haas) and many online course certificates of varying values.